A middle-aged man wearing an old suit looks relaxed while he is sitting in the shade in Joubert Park with a camera around his neck and a photo display nearby so that people walking through can see samples of his work. He is approached by a woman wearing a summer dress with her two young daughters dressed identically. The man and woman spend some time negotiating before he leads the family to a tree that has the best amount of light for the perfect photograph. He first positions the mother and then the daughters so that they are ready for the family picture. The man takes a couple of steps back; he encourages the children to smile and after two clicks the job is done. He first looks at the photos before asking the mother to pick the one she likes best. Back at his work spot, he prepares the printing process which happens immediately with the help of a small portable printer that gets its power from a connected motorcycle battery. The photo is then sealed in a plastic sleeve and handed to the customer. In exchange, she pays the photographer for his work. 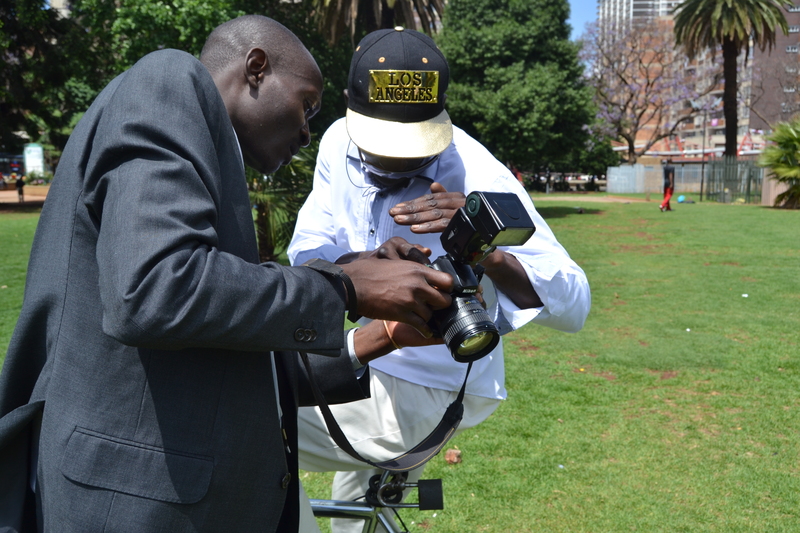 David Selepe is one of the ‘street photographers’ that operates in Joubert Park. Selepe has been working around the area since the 1980s and officially started working in the park from 1982. He has been in the same spot by the north entrance of the park since his first day. Selepe reminisces about the old days when things were different. “You were not allowed to sit down anywhere like I am doing now, only in designated areas of the park because this choice was for the white people. You were only allowed to walk around inside.” Selepe says as he looks off into the distance. Street photographers could take photographs inside the park if someone approached them and asked, however, once the job was done then payment had to happen outside. “It was illegal to do trade in the park and there was always a lot of security around,” Selepe says. He stretches his arms out a little and pulls up his sleeves to show the scars on his wrists that he got in 1983 when he was arrested. “A customer offered me money inside the park and security saw it. I was arrested immediately and the scars are because I fought against them when they tried to put on the handcuffs. I was taken to the station and had to pay a fine of R30, which was a lot of money back then, and I was let out,” Selepe says. SCARS FROM THE PAST: The dark rectangle-like mark is the scar David Selepe got from handcuffs when he resisted arres in 1983. 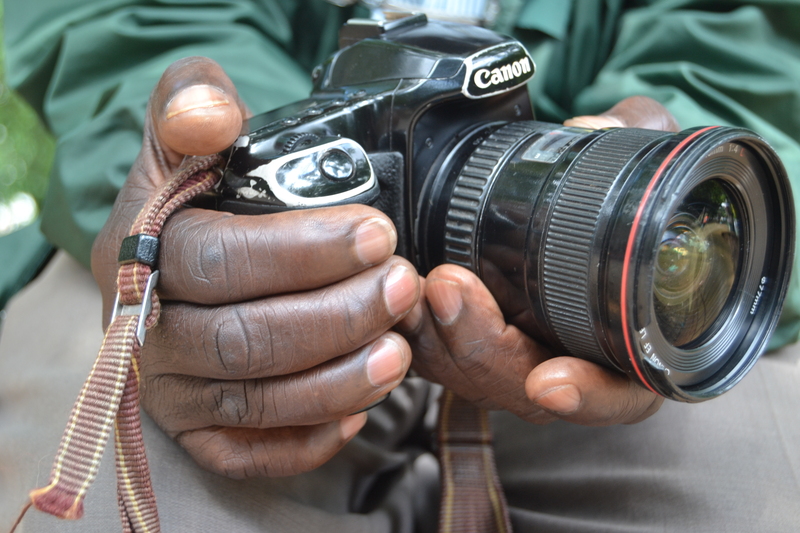 When Selepe first started working in the park, he was using a film camera, something that not a lot of people knew how to work compared to today and digital photography. He says that around 1995 more photographers started arriving in the park but cannot say whether this was related to the end of apartheid. Now there are about 30 photographers and each one has his own spot inside. Many of them can be identified by the umbrellas that they sit under and each one has also got a photo frame that displays his work. Selepe says that business has gotten difficult, mostly because of smart phones. People prefer to have photos taken with their cellphones. This is just one of the contributing factors behind the decline of business for the park photographers. Another factor that is hurting business is that the area is not regularly looked after. When you take a glance around the park or walk down its pathways the thing you notice the most is the amount of rubbish that lies around and the smell of urine that occasionally fills the air. Selepe also mentions how bad the crime used to be when there was no longer security looking after the park, “compared to the apartheid time”. Selepe says that there came a time when all the photographers that were operating in the park had a meeting and it was agreed that they (the photographers) needed to be the watchers of the park and look after the people. “If we see someone doing something wrong, we tell them not to do that,” Selepe says. He adds further that since the photographers started looking out for the park, “the crime has gone down”. During apartheid, they were viewed as a problem, however, many years later they now play a role in keeping the park safe. FROM ONE PHOTOGRAPHER TO ANOTHER: David held his camera in front of his face so I could take a photo. At the same time he took one of me. What once used to be the main attraction of the park was the striking circle fountain located in the middle. 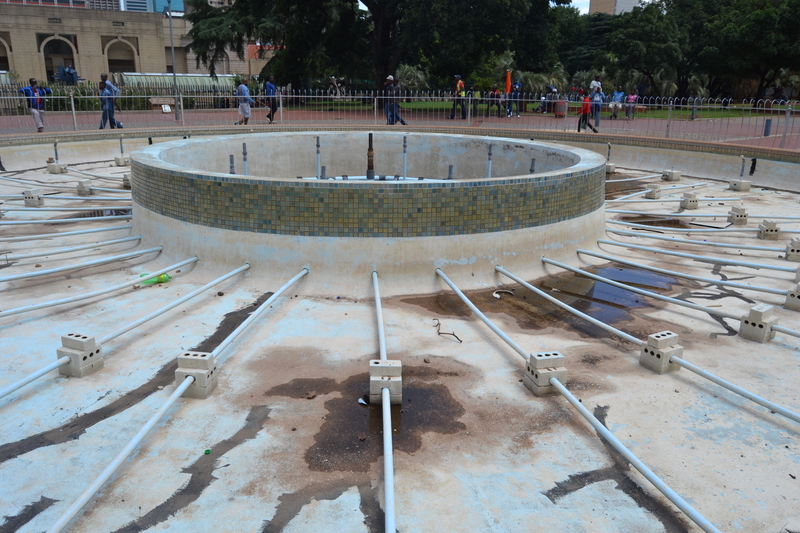 According to Selepe, when the fountain was working, there were six sections in the centre where the water would gush upwards around a metre or so high. The second layer to the fountain was surrounded by sections where water would flow out into a half circle and trickle into the pool of water surrounding the centre. He reveals more of what he remembers. The fountain had different coloured lights inside: red, blue, yellow and green. “During the evening you could see the lights through the water while it flowed,” Selepe says. He has a wide smile on his face and at one point he turns to look back at the now empty feature which stopped working five or so years ago. The Victorian Conservatory inside the Greenhouse Project, known as the “Greenhouse house” by the photographers, used to be another photo hotspot. The conservatory used to boast of its beauty with a complete glass and metal frame structure and different types of flowers that had rooted themselves in all areas of the greenhouse. “People liked it, it was a nice area to take photos in and sometimes wedding photos as well,” Selepe says. The conservatory is now closed off because it forms part of the Greenhouse project. This project is found in the northwest section of the park and it serves as a teaching ground about sustainable living. It has become a garden where vegetables and medicinal plants are grown by the community for the community. It is fenced around so as to keep it safe from crime. BROKEN AND ABANDONED: The park’s photographers are yearning for the fountain to be fixed. Selepe moves on from talking about the fountain and the conservatory, and starts talking about one of his photographs that have brought him great pride. When he worked with film he could do double exposure photography and one photograph he had taken was of a woman pictured in the middle of a flower. He cannot recall the exact year when he took it, but he remembers that he sold the photograph in 1995 to a young woman that had taken an interest in it. “I have my name and number on the back of some of my old photos and I got a call from a man in Cape Town. His daughter was the one that had bought my photo and he was impressed with how I had done it. He had it placed in an exhibition and my photo won a R15 000 prize which the man sent to me. My photo made it all the way to Cape Town!” Selepe exclaims with a look of pride and excitement on his face. Gift Zwane was another photographer that used to work in the park during the same time as David, but he passed away in 2002. 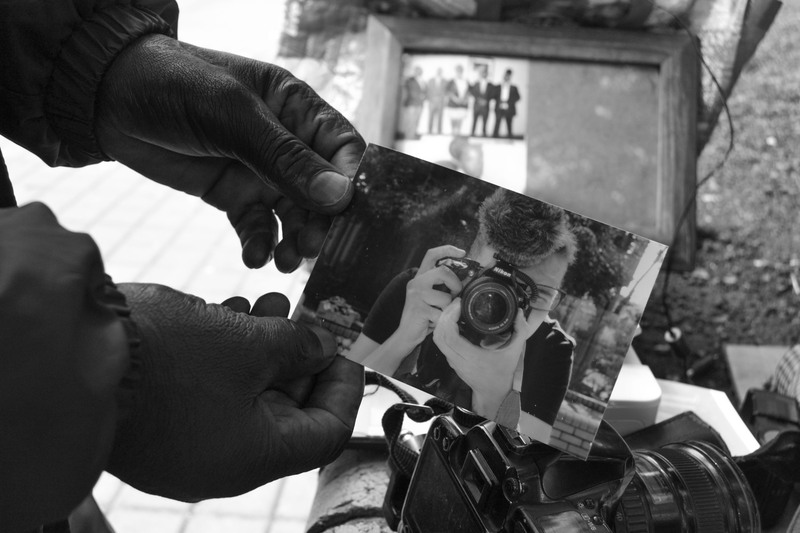 Zwane’s photography lives on through his sons who now also work inside the park. Both brothers see photography as a family business and they take great pride in this. Mkhululi Zwane started working in 1998 and Frank Zwane joined in 2001 after he finished school. The brothers’ work spot is close to the fountain and they each have a bench where they sit and wait for customers. Frank and Mkhululi both have a love for photography, and they work in the park because they can’t find work elsewhere. “My camera is my life,” Mkhululi says as he lifts his camera up to his face as if talking directly to it. Mkhululi, who has been taking pictures of a customer, shows the customer what he has taken and asks him which one he likes best. While the photographs are being printed, Mkhululi starts talking about what he earns for the day, which is all dependent on how business is for that day. Frank, standing next to him with his arms behind his back, nods in agreement with his brother. The brothers speak about the same concerns that Selepe had raised and that these are the reason business has declined for them as well. The breakdown of the fountain and the conservatory are named as being the main reasons things are difficult for not only the Zwane brothers but also for the other photographers. Although the photographers initially only took portrait photographs, they have become innovative and lately they take ID and driver’s licence photos as well so that they can keep business steady. They charge R5 more for this simply because the photos need to be cut and that wastes some of the photo paper. They use a white sheet as the background for these types of more specialised photographs. Each photographer respects the other’s space. If a customer goes to a specific photographer, the others do not try and get that person’s business. The price for portrait photos is the same price all round at R15 a photo, and ID or driver’s licence photos are priced at R20. This is also something that the photographers have agreed on. The photographers have some form of a brotherhood among them. If one’s printer or camera does not want to work when they have a customer, then another photographer will lend a helping hand. Frank says that going to help is important because “the same thing could happen to me one day”. Joubert Park is a community where you will find kids playing on the playground equipment, and men of different ages playing chess, either on the small boards they bring with or the giant chess board painted on the floor. It’s a place where people come to drink alcohol that’s kept in a plastic bag or to smoke dagga. It is also a place where people come to sleep during the day or to gamble with playing cards. In this mix, you will find the street photographers that see the park as their office or their studio. These dedicated individuals come every day, from dawn till dusk, and can be found in their spots trying to earn a living.